I tend to look for that good/best balance and most of software I use is quite good. Sometimes there is exception. App that is slow, with bunch of bugs and long abandoned by developers. App that does something so exceptionally good that flaws does not matter. qliner hotkeys is a such app for hotkeys launchers, forgotten underdog that no competitor can match. App allows to map common actions (launch something, open folder and so on) to Win+any key. That’s right – no obnoxious Ctrl+Shift+Alt+… combinations. Any and every hotkey here starts with Win and ends in another single key. 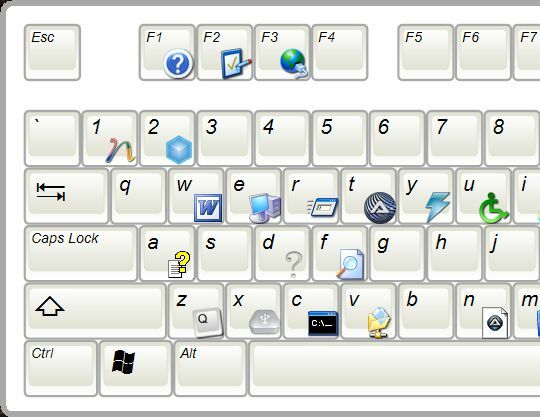 It has most fitting graphical interface (triggered with Win+Z or by holding Win for specified number of seconds) that displays all mapped hotkeys and allows to set new by simply dropping shortcuts on it. App logic easily obliterates most common issue – how to actually remember hotkey after you set it up. It makes combinations as short and possible and provides visual map on top. Superb logic and usability. What more is needed from hotkey app? The more it stays out of the way the better. it runs on .NET Framework and even if I am not a fan of platform (I like software truly portable) this is objectively bad here – it lags, eats memory by tons and likes to hang system (especially when network shortcuts are involved). Actually I only use it at work, because at home I have Logitech G15 keyboard, which offers enough of hardware hotkey bliss to not bother with software. Seriously I am not even sure you should try this one now (I picked it up when it still had some hopes to be developed). But I hope someone forks or completely re-writes this one. Or steals the idea at least, it is after all one of very few hotkey apps that actually make sense. there is convenient, tiny, useful and flexible alternative program. it doesnt require dotnet or any other bloated sdk or libs, fully configurable via single ini file, consists of single exe file about 20kb size. I know that one comes up a lot in hotkey-related discussions. However it is not an alternative to qliner one. qliner got constraints right. They narrowed down what can you do to ensure it is extremely easy for you to. actually hoekey with predefined configuration was tested on real practical usage on a lot of computers by many common users and system administrators. that is the chosen one among a lot of other free and opensource hotkey management software tools for win32 by long-term practical usage tests and investigations with various configuration customizing. the real geeks are not those who plaing toys. children are playing and toys and getting stuff done. the real geeks make real things that about getting work done. the real geeks are powered by free-range minds able to think, to change and to create. 1. Hold Win for a second. 2. Drag and drop shortcut on layout. Could you please break down same action in HoeKey? As I understand it will involve opening configuration file in editor and defining new entry. And please don’t go all a lot of computers by many common users on me. :) I speak for myself, you speak for yourself. Let’s leave crowd out. I am trying to convey why qliner hotkeys fits my needs that good and why I don’t feel comfortable investing my time in overly (for my taste) extensive hotkey managers. There are tasks where thinking is important and there are tasks where mindless reflexes are important. I treat hotkeys as latter. ControlPad will indicate that it is designed to be used with the numeric keypad; BUT, it can be used with any key (alpha or numereric). Has become one of my favorite apps… Also is portable! At home I just enjoy huge set of hardware keys for stuff. Doesn’t mix with regular keys and so has great usability. I was able to reassign the “middle click” on my mouse to use a side button that is rarely used (Logitech Mouse)when using MouseExtender. I do agree that the middle mouse button could be an issue and that other options are needed. I too have my mouse setup to automate many of the basic browser tasks (open, close, back, forward)and would feel handicapped without it. Developer is open to suggestions and being encouraged to develop MouseExtender further.